Ford CEO Alan Mulally: The auto task force likely will create new programs to help suppliers, if GM or Chrysler file for bankruptcy. DETROIT -- If Chrysler LLC or General Motors files for bankruptcy, the Obama administration's auto task force will prop up suppliers and prevent failures that could topple other automakers, Ford CEO Alan Mulally said Friday, April 24. 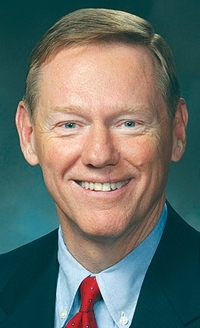 "They absolutely understand the impact of an uncontrolled bankruptcy," Mulally told Automotive News. "They'll do what it takes to make sure it's a controlled consolidation." Mulally wouldn't identify how many Ford suppliers are in critical condition. Up to 80 percent of Ford's suppliers are shared with GM and Chrysler. The task force is likely to create new programs to help distressed suppliers beyond the $5 billion Treasury Department fund currently in force, Mulally said. He described that program as a good first step but indicated that suppliers need more. The task force could provide more money to suppliers or provide "backstops to the banks for the money that goes to them," Mulally said. Ford is providing financial and technical support to its own suppliers as necessary to keep parts flowing, and that will continue should GM or Chrysler file for bankruptcy. Ford CFO Lewis Booth said the company has increased its financial provisions for helping distressed suppliers beyond what is normal.